2BR/1BA Open octagon floor plan home with Loft which can serve as additional bedroom or den area. Beautiful lake views directly in front of this house and nice large front deck areas. Home is on a 500M2 lot. There are about 20 homes inside the community. Many homes here have additional studio cabins attached to the main house deck areas. So you can rent the home out separately or together with these additional “casitas”. This lot could easily accommodate additional casita unit. Lot is nicely landscaped with many kinds of plants and flowers and trees This home is an affordable and comfortable 2BR home with lake view with finer quality construction and finishes-granite counters, hardwood floors and cabinets and doors, ceiling fans, stainless steel appliances, newer washer and propane dryer. Large tiled bathroom with big shower stall and 2 windows. THIS IS A GREAT RENTAL UNIT IN A BOOKED YEAR ROUND LAKE FRONT RESORT COMMUNITY WITH POOL AND CLUBHOUSE! Many larger homes here in the community selling from $200,000 to $650,000 just next door and across the street. An excellent choice of location on Lake Arenal. 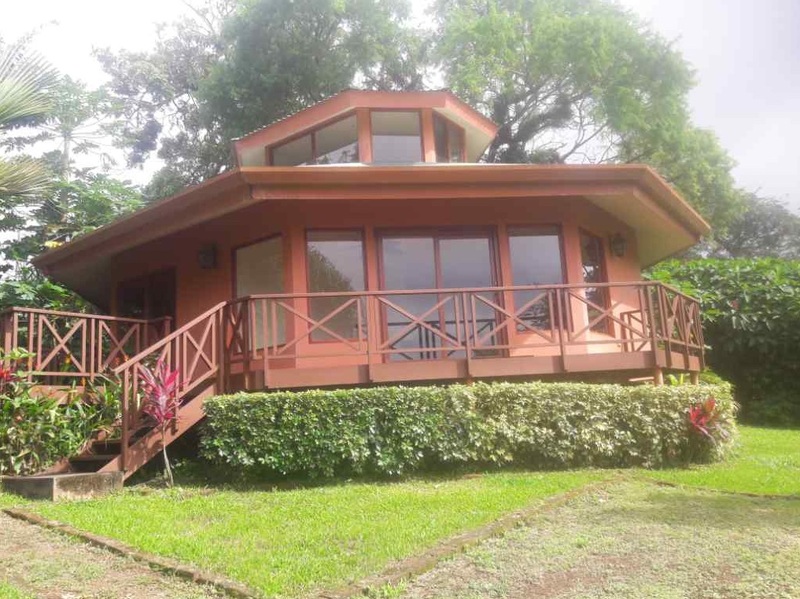 House is located in a secure gated LAKEFRONT community next to Puerto San Luis. The premiere lake port on the lake where you have large catamaran tour operator, (El Tucan Arenal) and easy access to the lake for jet skis, boats, kayaks, paddle boarding, skiing, fishing. There is a public access boat ramp, boat docks, and a public lake front grassy beach just a few minutes walk from this house. A multitude of birds, monkeys, sloths, and other wildlife living here in and around the development. Development also has pool complex with clubhouse for owner events. This location allows travelers and tourists ease of access to many parts of the country–1.25 hours to Liberia Airport, Hot Springs Volcano resorts, Rainforests, Cloud Forests, 1.25-2 hours to beaches and Golf in Coco, Hermosa, Ocotal, Flamingo, Conchal. 25 minutes to Pan American highway Rt 1-3 hours to San Jose. Perfect temperatures – Breezier, greener-semi tropical climate-70’s to 80’s year round. LOW ELECTRIC COSTS AS OPPOSED TO NEEDING AC AT THE BEACH WHERE IT GETS STIFLING HOT! Units like this one now renting in the development for $80-$150 a night. HIgh season rates December January, Easter week, higher rates always. This is a very smart retirement/vacation/resort rental home choice. An easy to afford quality home here in a lakefront setting. When you are not using it, it’s working for you. Electronic gated security and guard here 7 days. It’s safe and secure.